This is a highly curated program. Students will spend most days with a trip leader, either the director or one of the other professors. Of course, you will have some free time, but a majority of the time will be spent either in class or in planned cultural and professional visits. The Winter Intersession program in Brazil will start December 27th at 2pm in Sao Paulo Brazil. Students should plan on flying into Sao Paulo early in the morning on the 27th, and fly home from Rio de Janeiro at anytime on either the 12th, 19th or 24th of January. Depending on the session, students may take up to TWO three-credit courses for a maximum of 6 credits this January. Planned class times are shown below, but are subject to change. Depending on the Session, students may take either one or two courses. All students are required to attend the "Introduction to Brazil" module. Students are free for lunch with friends or professors. 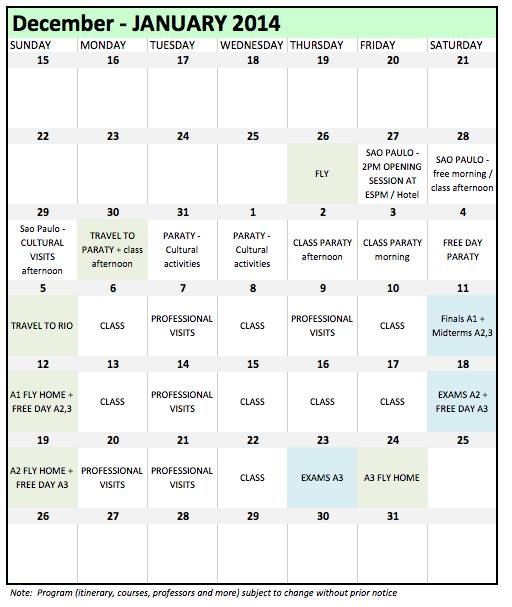 Some days, students will attend required cultural and professional visits or visit the cities during scheduled free time.